Located in the northern part of the Napa Valley, nearly equidistant from the towns of Calistoga and St. Helena off Hwy 29, this 2,000-acre park features both oak woodlands and conifer forests, which are delineated by the canyons of Ritchey and Mill Creeks. Once the childhood playground of Lillie Hitchcock Coit (Coit Tower), this park now offers the public opportunities for hiking, bicycle and horse riding, camping, swimming, and picnicking. Over 10 miles of trails include the popular 6.5-mile Redwood-Ritchey Canyon trails hike (with longer and shorter options). It is also possible to hike to the nearby Bale Grist Mill State Historic Park, about 2 miles round-trip. 61 camping sites (family, walk-in, group) are available year-round. The swimming pool, one of only two found in the state parks system, is open weekends, Memorial Day through mid-June, and then daily through Labor Day. 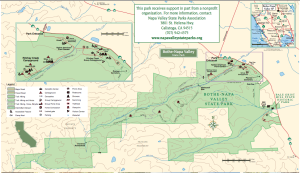 This park is currently (as of 2015) being operated by Napa County Regional Park and Open Space District and the Napa Valley State Park Association. Learn more at napavalleystateparks.org . Dogs are restricted to camping and picnic areas and must be leashed during the day and inside vehicles or tents at night.